These layout photos were taken after the November, 2005 open house. 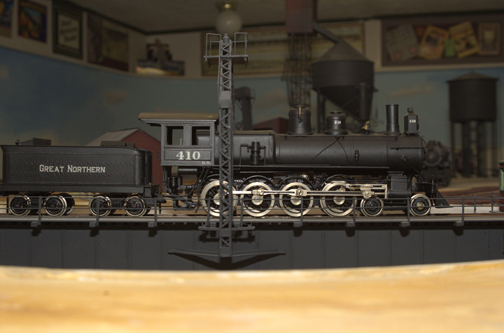 An AMH 4-4-0 crosses the 40" Howe truss bridge to Fidalgo. It will not go much further since the track currrently stops at the end of the bridge. The engine was recently acquired on Ebay for less than $75 and runs very well. - running light that is! Pulling is not its forte. Some ties have been laid but no rail yet. To the right is the floor of the soon to be erected 11 stall roundhouse that will follow plans for a standard GN 116' structure. The fact that there are no rails does not prohibit the 'new-to-me' G-1 class Twelve Wheeler from taking a spin. The model's complete history is still unknown to me. I recently obtained it from an estate and the papers indicate it was hand built by the founder of Tenshodo Models. Its drive was rebuilt by Fred Icken and runs like a Swiss watch. A W-1 electric eases the eastbound Builder out of the Puget holding yard. The observation Going-to-the-Sun Mountain passes the Spokane holding yard where the 3381, a westbound O-8 Mike, is waiting to depart with a manifest freight. 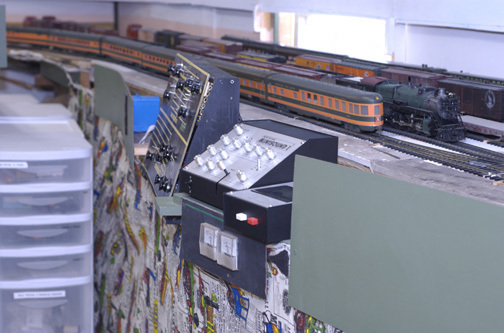 An eastbound Fruit Block, runs past an 'undisclosed location' on the layout. Through the miracle of Photoshop, the Cascades appear instead of plain benchwork. As noted in the captions, several other pictures have also been retouched in Photoshop. 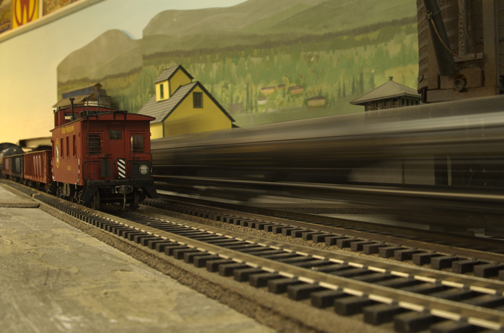 The reefer train passes Cashmere, where it passes a work train. The future roundhouse is on the right. 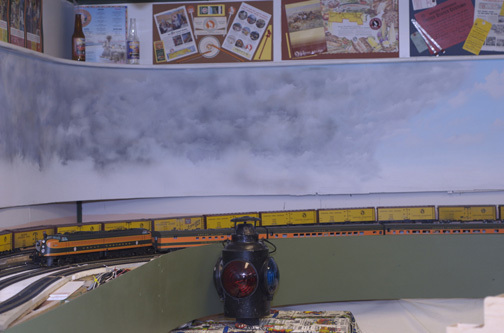 The temporary backdrop painting is actually a Masonite panel given to me by my good friend, Charlie Morrill when he dismantled his outstanding layout. Another view of the reefer train at Cashmere. 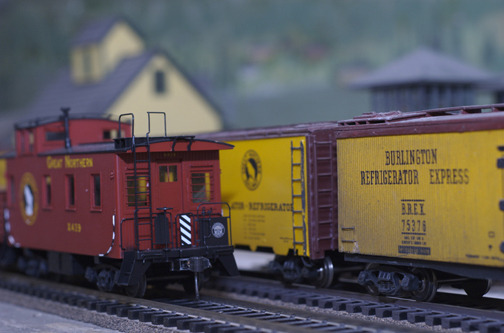 A close look at the caboose's platform reveals an SP, not a GN 'Safety First' herald. There is a story, but it is too long to relate here. 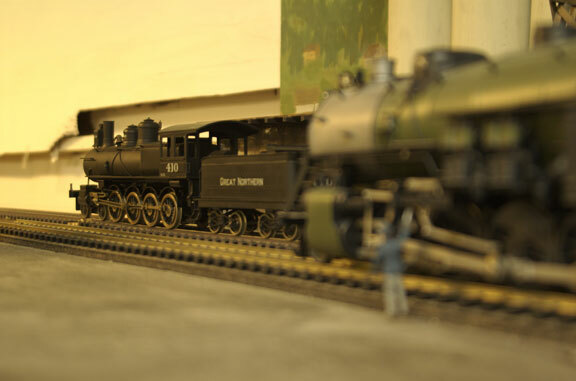 A tank car on the O-8's manifest freight streaks past the work train at Cashmere. 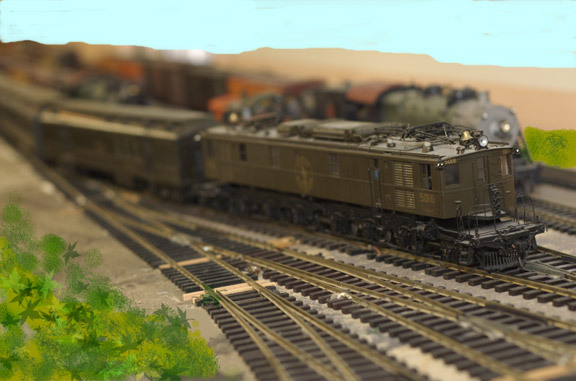 The work train is preparing to start ballasting the right of way. The 410, a 4-8-0 leaves at dawn with a peddler freight. This is another retouched picture. See below for the untouched picture. Titans, past and present. The peddler passes a mightly 2-10-2 that has stopped because of a hot box. 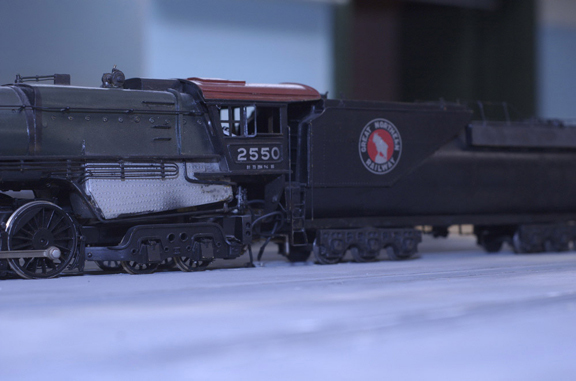 When delivered, to 'Conquer the Cascades', the G-1 was the largest and heaviest locomotive on the roster. 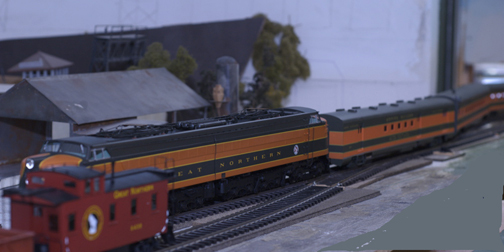 By the end of steam, the Q-1 class 2-10-2 held that title on the GN for non-articulated locomotives. The 2550 an S-1 Northern rests at the roundhouse between assignments. The concrete ( hyrdocal) floor, rails and pits are in but the rest of the 11 stall roundhouse is still under construction. Y-1 electric motor number 5016 passes Spokane yard with the heavyweight Empire Builder. This photo was retouched in Photoshop to remove the benchwork. 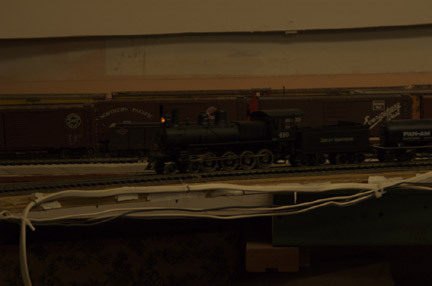 The blurry locomotive in the Spokane holding yard is the 3216, a class O-4 mike. An S-2 Northern now pulls the heavyweight Empire Builder. This photo was also retouched in Photoshop to remove the benchwork. I sort of went crazy with the grass tool. 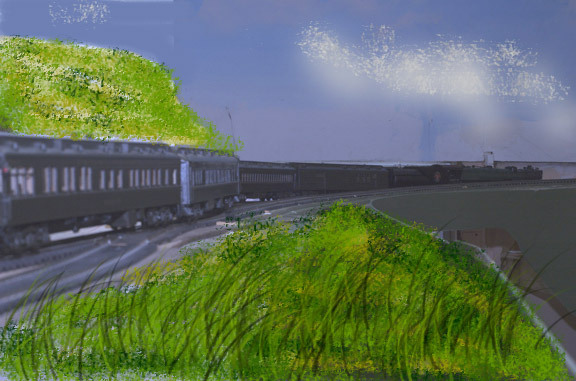 Someday real soon there will be actual scenery along the line! 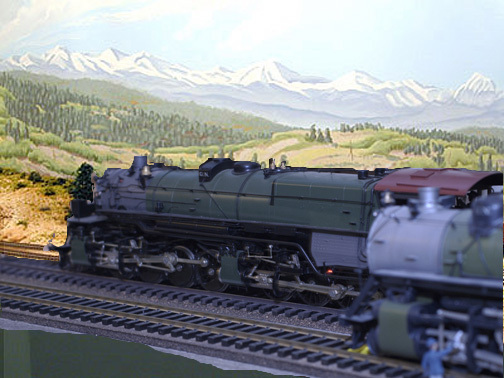 Finally the 2003, an N-3 2-8-8-0, passes the 2125, a Q-1 2-10-2, whose engineer is oiling the running gear. This backdrop was also created through Photoshop and 'pirateware' off the web. 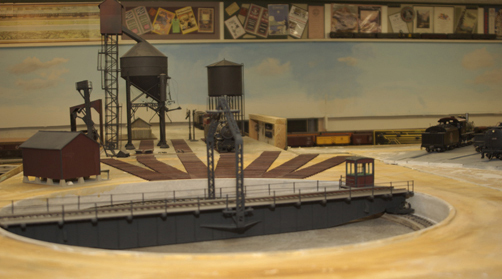 I actually found the picture on Dave Frary's scenery page and thought it looked fantastic. Hope he doesn't mind.